The World's Mightiest Mortal is reborn in The New 52 in this incredible tale from JUSTICE LEAGUE #7-11, 0, 14-16 and 18-21! 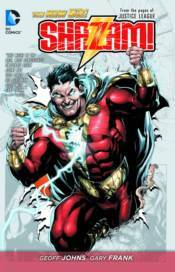 Young orphan Billy Batson has bounced from foster home to foster home, but when he's drawn to the Rock of Eternity, he is imbued with powers beyond those of any mortal man! Can he learn how to handle those powers in time to defeat the villainous Black Adam?